Talk #1 “Who is Jesus?” /イエスとは? Talk #2 “Why did Jesus die?” /イエスの死とは? Talk #4 "Why and how should I read the Bible?" /聖書を読むには? 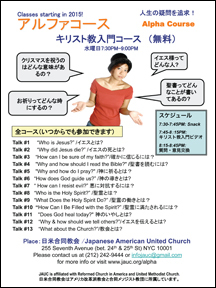 Talk #6 “How does God guide us?” /神の導きとは? Talk #11 "Does God heal today?" 神のいやしとは? Talk #12 “Why & how should we tell others?”/イエスを伝えるとは? Talk #13 “What about the Church?”/教会とは? Please contact us at (212) 242-9444 or infojauc@gmail.com if interested.